From the airport take the train to Central Station Amsterdam. Trains leave every 10 minutes and the ride is about 20 minutes. 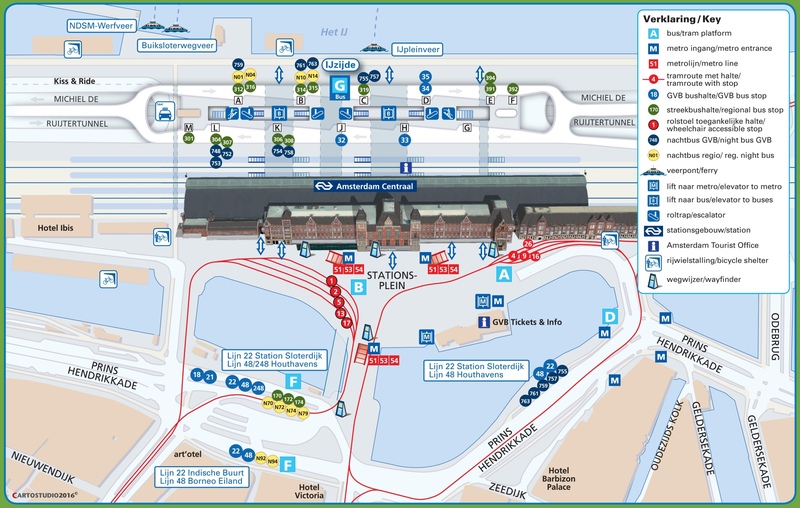 Take any Metro (underground at Central Station) and get off at the first Metro Station called Nieuwmarkt. There are several exits, please make sure to take the Nieuwmarkt Exit. Upon getting up to the street level, take the second street to your left and you have reached our street/canal called the Kloverniersburgwal. Fourth house from the corner, you will find Tulip of Amsterdam B&B at house number 9, next to Gusto Restaurant. There are two main doors, take the door to your right and pull the doorbell on the right side of the door. From the airport take the train to Central Station Amsterdam. Trains leave every 10 minutes and the ride is about 20 minutes. Coming out of the Central Station (Centre side) you will see a big Church across the street/station. Next to the Church on the right side you will see The Barbizon Hotel. The street next to it on the right side of the hotel is the street Zeedijk. 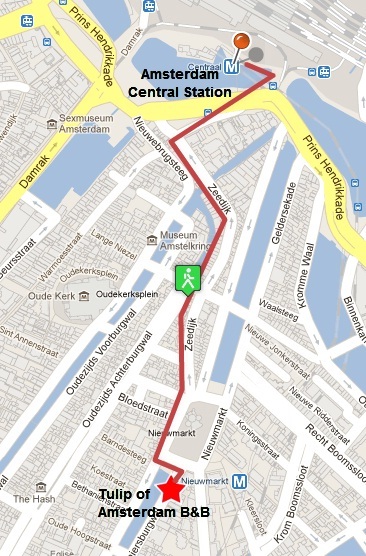 Turn left into Zeedijk and walk through until you reach Nieuwmmarkt Square. You will see a prominent castle in the middle of the square. Cross the square and keep walking on the left side. Now you will see a canal in front of you. This canal is the Kloveniersburgwal. 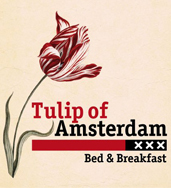 Tulip of Amsterdam B&B is the fourth house at number 9 next to Gusto Restaurant. There are two main doors, take the door to your rightand pull the doorbell on the right side of the door. OR, take a Taxi from Central Station and this will cost you around EUR 15.00.